DrinkMore Water, an industry leading bottled water company, now provides bottled water delivery in 3 and 5 gallon glass bottles. As more and more bottled water consumers shun plastics, DrinkMore Water has stepped up to meet growing consumer demand for non-leaching, BPA-free containers. Our customers love DrinkMore Water for many reasons – the great taste of our water, our friendly staff, the fantastic customer service and the fact we’re local. We thought adding a glass bottled water delivery service option was a logical next step. DrinkMore Water has proudly delivered the highest quality bottled water to homes and offices since 1993. Now DrinkMore Water is providing a new premium glass bottled water delivery service to meet growing consumer demand for non-plastic bottled water options. Demand for non-plastic bottled water has skyrocketed in the past couple of years as consumers seek alternative, BPA-free bottle options. Enter DrinkMore Water. 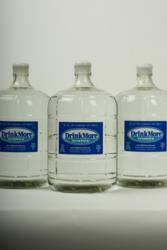 Recognizing consumer demand, DrinkMore Water added a new product line of 5 gallon and 3 gallon glass water bottles to be delivered directly to homes and offices. “Our customers love DrinkMore Water for many reasons – the great, clean taste of our water, our friendly staff and the fantastic customer service they provide, and the fact that we’re locally owned and operated. We thought that adding a glass bottled water delivery service option for our most purity-discerning customers was a logical next step,” noted Bob Perini, CEO and President of DrinkMore Water. A variety of factors contribute to growing consumer demand for water delivered in glass bottles, including the fact that while plastic bottles have the potential to leach chemicals into water to some degree, glass bottles do not. Glass is a non-porous and inert material, which means chemicals cannot leach from glass containers into water. Another factor contributing to increased glass bottle demand is that water can safely be store indefinitely in glass containers (provided they are stored out of the sunlight). Thanks to DrinkMore Water, consumers in the Washington, DC, Maryland and Virginia metro area that have water delivered in plastic bottles can easily switch to delivery of water in 3 & 5 gallon glass bottles. The glass bottles provided by DrinkMore Water also work with the same dispensers that use plastic bottles so there is no need for a special water dispenser. DrinkMore Water is a locally owned and operated bottled water company that provides ultra-purified bottled water to homes and offices throughout the Maryland, Virginia and Washington, DC area. Since 1993 DrinkMore Water has been bottling ultra-purified water while seeking to effect positive change in the community through good corporate citizenship.